FRAMINGHAM, Mass.--(BUSINESS WIRE)--Nov. 12, 2014-- Staples Inc. (Nasdaq: SPLS) makes less stress and more savings happen this holiday season with the top ten gift trends. Holiday shopping has never been easier with Staples’ gift trends, amazing deals, guaranteed savings with Price Match Guarantee, Staples Rewards® and multiple ways to shop in-store, online and via mobile. Wearable Tech: Wearable tech will be hot this holiday season. 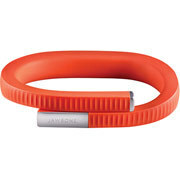 For mainstream adopters, look for health trackers like UP24™ by Jawbone ($129.99) or the Fitbit Zip, Fitbit One or Fitbit Flex ($59.99-$99.99). Early tech adopters will gravitate toward smartwatches, like the MOTO 360 ($249.99), a stylish, sophisticated wristwatch that displays notifications based on where users are and what they are doing, available at Staples starting Nov. 18. Streaming Technology: Streaming media players like Google Chromecast ($35.00), Amazon Fire ($99.00) and Amazon Fire Stick ($39.00) allow users to stream entertainment right to their TV. All three devices support Netflix, YouTube, Hulu Plus, Pandora and more. Tablets: New tablets, like the Asus 10” and 8” Android tablets and the Samsung Tab S 10” and 8” tablets deliver a spectacular screen and user experience. Plus, shoppers should be on the lookout for big discounts on older versions of laptops, as well as trade-in/trade-up deals ($169.99-$499.99). Audio: Innovative technology brings LED to the listening experience – JBL Pulse Wireless Bluetooth® Speaker ($199.95) uses programmable LED lights that pulse to the music. Beats by Dr. Dre headphones ($279.99) continue to be popular and deliver superior sound. Do-More Tech Accessories: Tech accessories that do more – Mophie® Space Pack ($149.95), the world’s first battery case with built-in storage, projection keyboards and illuminated auxiliary cables ($19.99-$29.99) make for a perfect stocking stuffer. Metallic Hues: Gifts shine bright this holiday season – choose from fashionable and bold styles in abstract patterns from the Cynthia Rowley Collection, sold exclusively at Staples, or the gold and silver office accessories from Poppin® to add a bit of dazzle to gift giving. Perfect gift-giving ideas for the home or office (99¢ - $18.00). Fresh Floral and Nature-Inspired Accessories: Straight from the runways and a perfect gift for her, the floral patterns from the Cynthia Rowley Collection, sold exclusively at Staples, or the distinctive home and gift items from the Secret Garden, Lazy Days and Kraft Paperchase collections make charming gifts (99¢ - $49.99). Nautical Accessories: The Anchors Ahoy collection from Paperchase gives a nautical spin to gift giving this season with delightful nautical prints on picture frames, tote bags, journals and more ($2.99 - $49.99). Do-It-Yourself/Customizable Gifts: Design and print a customizable smartphone case (as low as $24.99) or tablet and laptop skins ($34.99) at Staples Copy and Print. Create a beautiful photo wrapped canvas as a gift of special memories (as low as $34.99) or create a special, commemorative 2014 holiday ornament (as low as $12.99). Go-To Party Gifts: Fun gifts for office parties, hostess gifts, holiday gatherings and more – like the Bendy Wine Aerator ($14.99), Plunge Wine Bottle Stopper ($7.99) or Wine Monkey Bottle Caddy ($9.99) by Fred & Friends. In addition to great gifts, Staples offers more easy ways to shop including the in-store kiosk, buy online pick-up in-store, ship to store and free shipping from Staples.com for Staples Rewards® members. Staples customers can buy, package and ship gifts in one stop with the expanded selection of packaging and shipping products as well as UPS shipping services in all stores and USPS Approved Shipper Program in select stores.